Welcome back to our new weekly column, What I'm Wearing, where we ask members of the team to share what's on their wrists. We're not just talking about the fitness trackers and smartwatches themselves, but the straps, watch faces and other accessories they're pairing them with. If you have an accessory, app or watch face that you think we are going to love, whether it's for an Apple Watch, a Fitbit, a Garmin or any other wearable, drop us a line at [email protected] and it could end up in a future edition of What I'm Wearing. I have just started wearing the Fitbit Ionic, and for now I've got the basic but functional silicone band that comes out of the box. But I didn't want to be completely boring, so I added some panache with the Retro Sunset watch face. It's blowing my mind. You can almost hear the John Carpenter synth soundtrack in the back of your mind as you race towards that 80s neon wire-art sunset. Simple taps will cycle through your fitness statistics and time, and if you've ever played Far Cry: Blood Dragon, well, you're going to want to pick it up again. I looked at some of the other watch faces in Fitbit's App Gallery, but Retro Sunset is the one that's stuck. As for the rest of the Ionic, I'm surprised it's as comfortable as it is. Fitbit's fit never seems to agree with me. From the Charge 2 to the Blaze, they all kind of feel like they're choking my wrist. 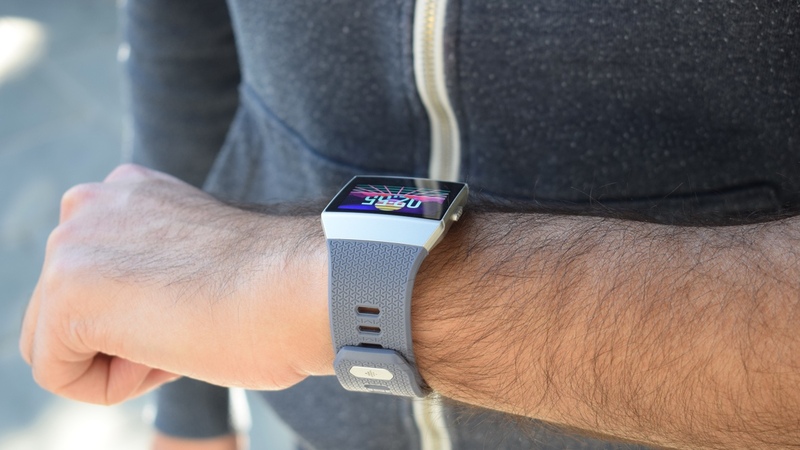 The Ionic is the first Fitbit that feels comfortable, though it's still quite a bit bulky and not all that handsome. Good thing I have such an exciting watch face to distract my eyes, then. It's not much of a looker, but I've been testing out Garmin's latest fitness tracker, the Vivofit 4 (look out for the full review soon). I've got the very basic black version, which hasn't earned me any compliments, but I've worn more hideous trackers in my time. I also like that it has a small screen for performing the most basic service of showing me the time. Before putting on the Vivofit 4 I was wearing the Biostrap, but the lack of a clock meant I was wearing a "dumb" watch with it (a Mondaine Evo Big Date, if you're asking). I get to ditch that with the Vivofit 4, on which I've gone for a simple, clean clock face, as I'm often checking the time on it. It's not really one for notifications though, just alerting me to calls, and the fitness tracking is extremely basic; there's not even a heart rate monitor. But I like that it's waterproof, and the year-long battery means I never have a reason to take it off. Especially as it tracks my sleep. Ok, I know I'm cheating by having two this week, but a few days ago I went to a fancy dinner and I knew the Garmin Vivofit 4 just wasn't going to look the part. So I dug out my Skagen Jorn, one of my favorite hybrid smartwatches of the last few months, but I was getting a bit sick of seeing the sand-colored band – so I switched it up for Fossil's 'saddle leather' strap. It's a beaut; genuine dark brown leather and lighter stitching make the watch look even classier, and feel a bit sturdier. Sadly Fossil doesn't seem to sell this strap anymore, but you can pick up the Estate band, which is very similar.